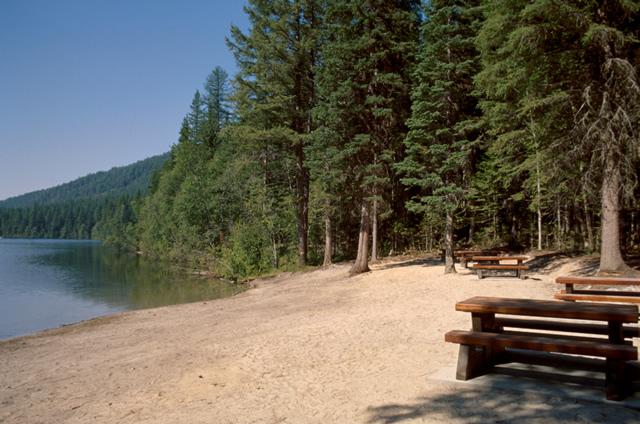 This park offers all of the ingredients wanted for camping in a wilderness setting. The lake is approximately 3 km long and fly fishing for rainbow trout is a very popular activity. Jewel Lake Resort is located on the south end of the lake and can provide you with basic essentials and boat rentals. There is a maximum 10 hp boating restriction on the lake. Car-top boat-launching facilities are available in the park. 12 km (8 miles) off Hwy 3 east of Greenwood. The park is 3 km from the resort with the last 1.5 km being gravel road. History: The park was established October 22, 1981. Jewel Lake is perfect for canoeing and kayaking due to its small size and the engine restriction on motorboats. The lake is approximately 3 km long and fly fishing for rainbow trout is a very popular activity. The lake is stocked with both brook trout and rainbow trout from the Summerland Trout Hatchery. Boats are restricted to 10 horsepower. Jewel Lake Resort is located on the south end of the lake and can provide you with basic essentials and boat rentals. There is ice-fishing allowed on Jewel Lake. Anyone fishing or angling in British Columbia must have an appropriate licence. There are no lifeguards on duty at provincial parks. There are no buoys marking the swimming area. There is ice-fishing allowed on Jewel Lake. Anyone fishing or angling in British Columbia must have an appropriate licence. Car-top boat-launching facilities are available in the park. There is a gravel parking lot that will accommodate approximately 10 vehicles. Below the parking area, the road does continue to the lake but ends in a steep drop off (too steep for a trailer) with no parking and a small turn around area too small for vehicles towing a trailer. It’s best to park above or back down the road to drop off a boat. There is a pit toilet located at the parking area. Boats are restricted to 10 horsepower. A hand pump is available roughly 50–100m from the campsites. Interior Health has issued a permeant “boil water” advisory on this source. This park has a day-use/picnic area with a gravel parking lot large enough for about 15 vehicles. It is approximately 100m down a wide, gently sloping path to the small, secluded beach of sand and grass. Two pit toilets are located just above the beach. There are five picnic tables and two freestanding BBQs on the beach that is surrounded by thick cedar/hemlock forest. There is a beautiful view down the lake from this serene, private spot. This park offers an old-fashioned camping experience in a natural setting with 26 vehicle accessible campsites, including 3 double sites, all available on a first-come, first-served basis. The majority of sites are small and private, enclosed by a thick forest of young hemlock and Douglas fir with a mature birch and larch towering above. The sites are not appropriate for 5th wheel trailers and other large RVs. There is a self-registration vault where campers can deposit their fee if no staff are present. Greenwood, 12 km from the park, provides the nearest community services. Pit toilets in the campground are wheelchair accessible.